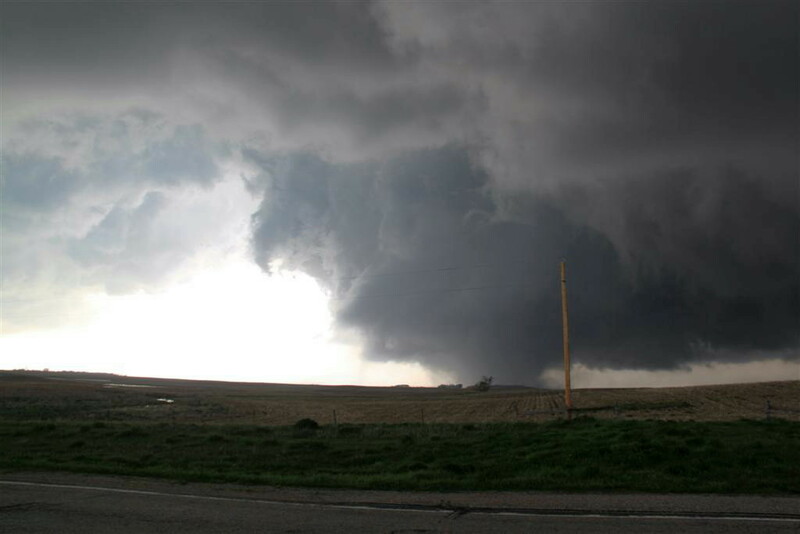 May 22nd, 2010 Bowdle, SD EF-4 Wedge Tornado! “WOW”, there are no words to describe this one! It was simply a once in a lifetime chase day. 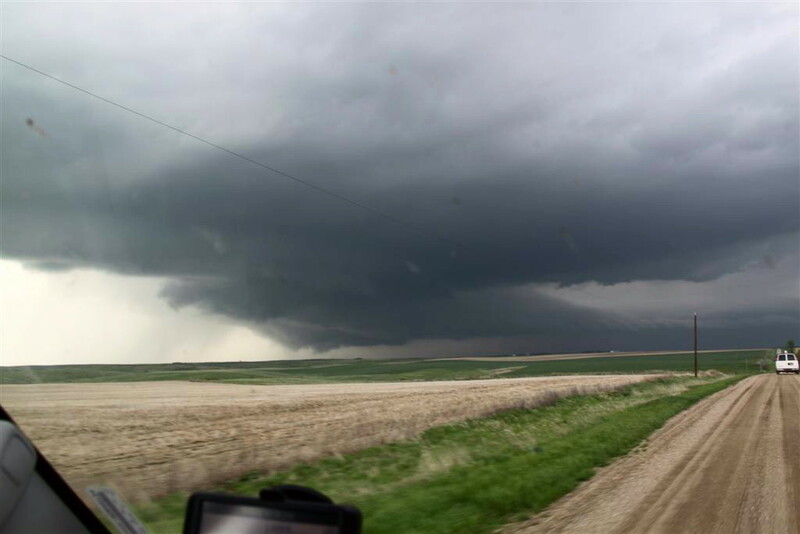 We started in Valentine, NE with an initial target of Pierre, SD. This was a high risk / high reward day. All of the ingredients were there, but so was a very strong cap that might prevent storms from firing at all. Our plan was to find the triple point and wait, hoping that the additional convergence there would allow an updraft to break the cap and get a storm going. After lunch in Pierre, we decided that we needed to get north, and eventually stopped in Gettysburg, SD. It was clear that the triple point was almost directly over us: To our north, a line of cumulus towers being sheered over to the right, to our southwest, another line being sheered over to the left. We watched and waited as tower after tower went up, looking good at first but then sheering over and dying as the cap continued to win. Finally though, the cap broke and the show began. 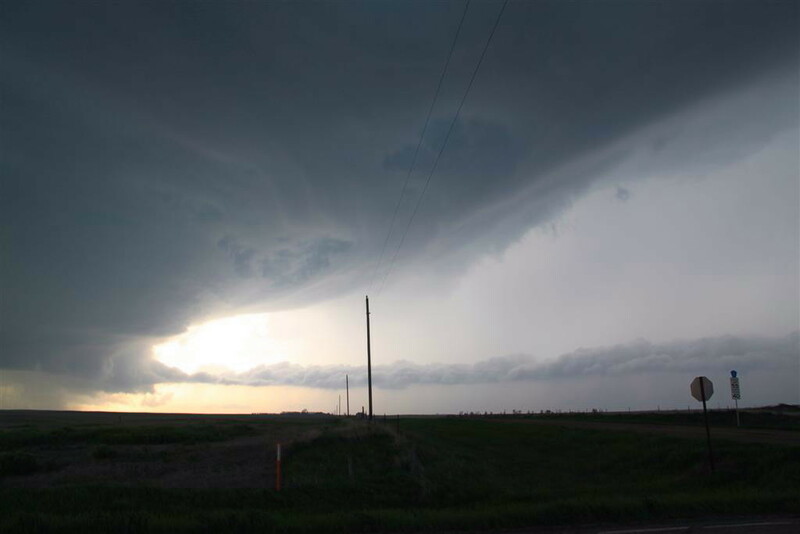 We headed north with our storm, which started showing supercell characteristics almost immediately. We stopped along route 83 north of Gettysburg and the storm developed a lowering and showed clear signs of rotation. As the storm moved over the road, we were forced onto a dirt road east through Lowry. As we got north of the town, it was obvious that the storm was going to tornado any second. Back on pavement we pulled to the side of the road as the storm produced a strong cone tornado coming almost directly at us! We watched for a minute or two, and as the tornado approached from the southwest moving northeast, we headed north to stay ahead of it. 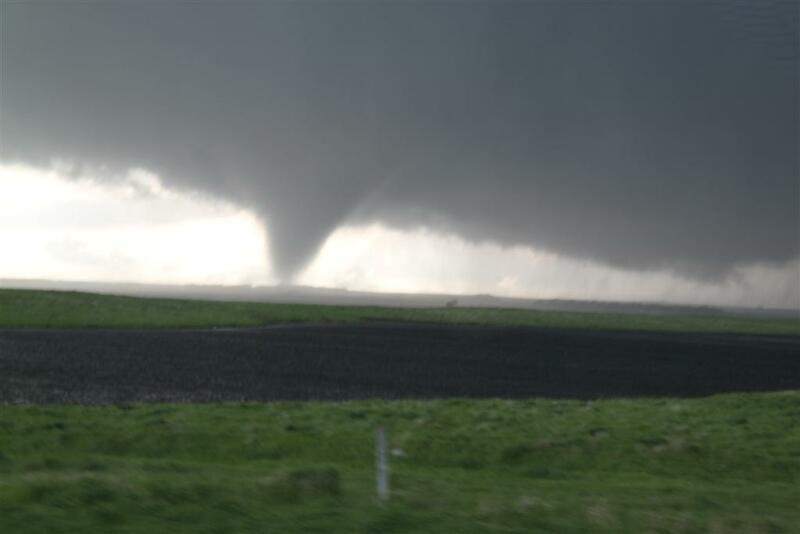 At the next road, we turned east towards Bowdle, while the tornado had temporarily dissipated. 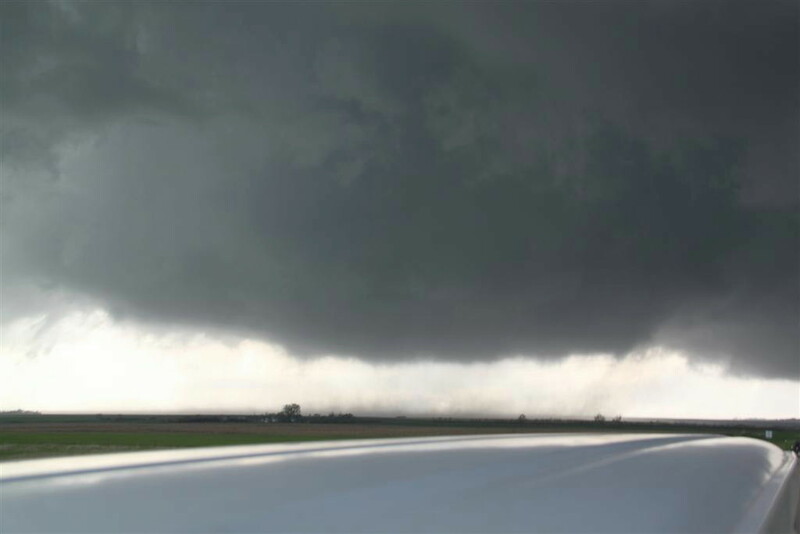 As the rotation crossed the north road where we had been it touched down again and I saw a suction vortex just miss a chaser who had just driven right up to it for some idiotic reason. As we raced east, the new tornado then became a massive stovepipe tornado with a big debris fan, just in the field behind us. I could only catch little glimpses as it was over my right shoulder as I drove, but as we got into Bowdle, I saw it crossing the road a ways behind us. Reports are that it took down the power poles and blocked a lot of the chasers, which would make sense because there were very few with us for the next stage. 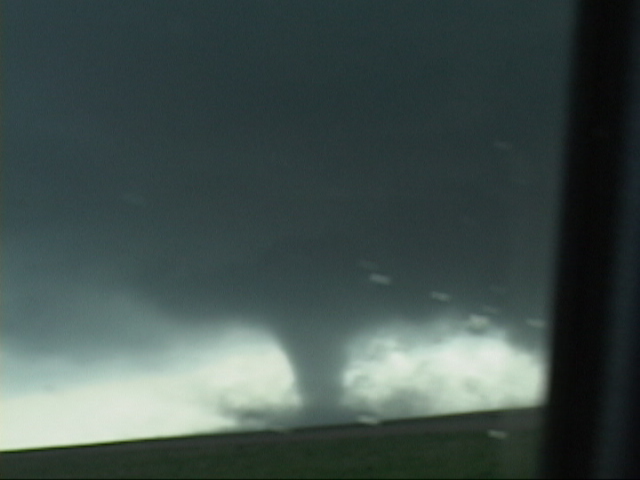 Finally, we were forced to run south as the RFD got to us, blasting us as we headed back in to Bowdle. We bolted east towards Roscoe to stay with the right moving storm that was now moving almost due east. Getting out of Roscoe, our old tornado had died, but as we got to Ipswich, a new, nicely contrasted elephant trunk appeared almost right over Roscoe with a big debris fan. We again stopped and watch the elephant truck do its thing. 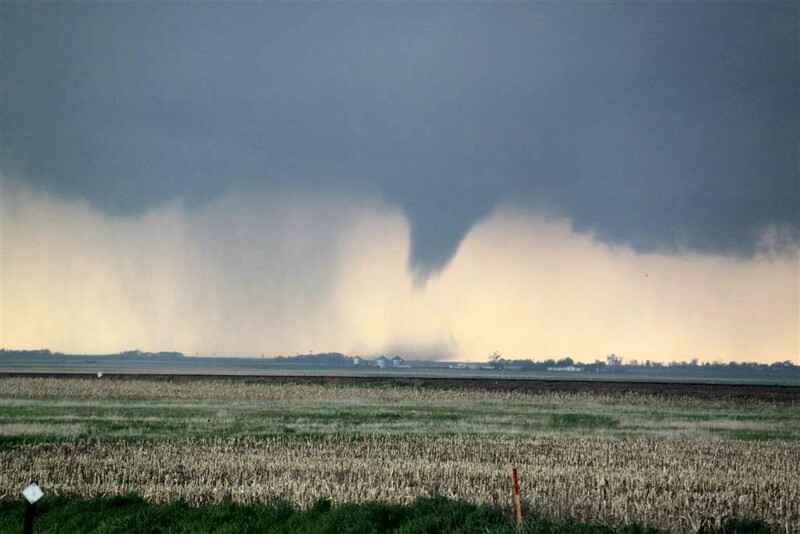 After that tornado dissipated we headed north a few miles out of Ipswich and saw three more brief tornadoes, including two on the ground at the same time! By this time the storm was becoming an HP moose, with an angry green hail core coming right at us. Abandon ship! As we loaded up, the core right to our west totally collapsed in a clearly visible wet microburst, very interesting to see. We blasted south to get out of the way, and I watched several cars of locals heading north, apparently unaware that they were about to be pummeled with hail. I tried honking and pointing the other way to a couple of them, but nobody paid attention. We decided it was time to bail from that storm and head south for the new tail end storm, which was also tornado warned. 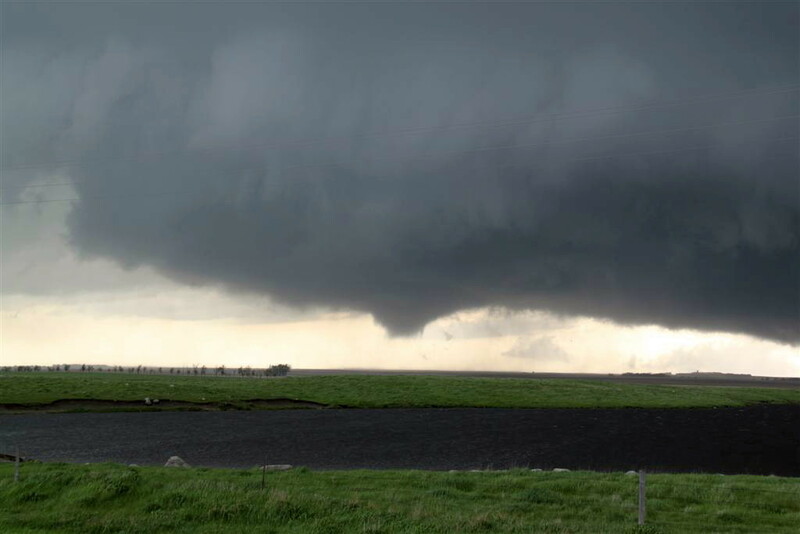 We were in perfect position to sit and wait for it, and as it came towards us we watched as three different times it tried to tornado but never did. 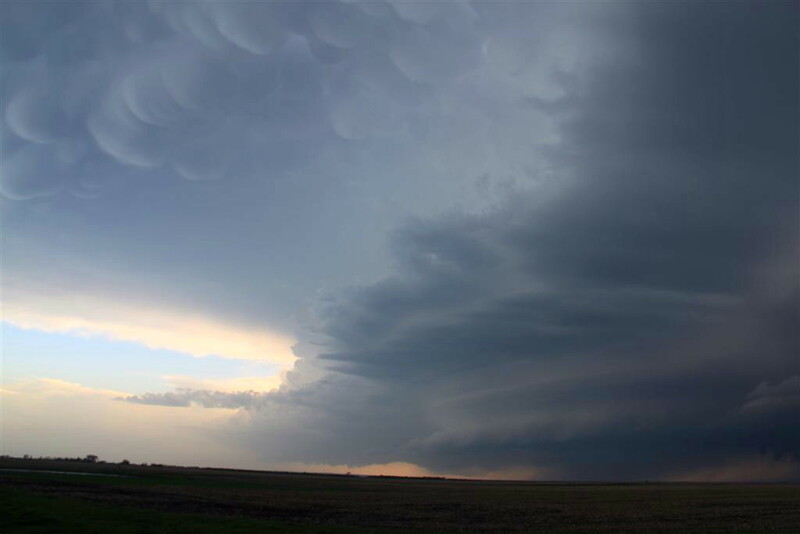 The structure however was incredible: 4 layers of stacked plates, beautiful mammatus clouds, and a monster beaver tail. We watched for awhile and then decided to head for the hotel since we had a long way to go to get to Winner, SD, our stop for the night. We headed south as the whole set of storms became a huge line segment running from Nebraska to Minnesota, in our path almost the whole way! 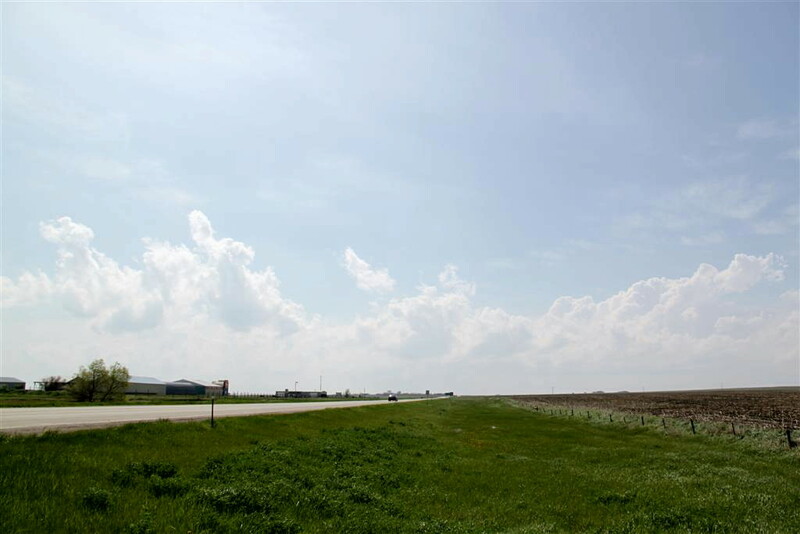 We stopped in Miller, SD to gas up, and then decided to head west to blast through the cores, and then go south in clean air. Fortune was with us as there was kind of a hole in the line when we headed west, and we got through without much of an issue at all. We were then treated to a fantastic lightning show along the rear flank of the squall line, all the way for the 140 miles to our hotel. What an awesome day! It lacked nothing and I can’t think of a single thing that I would have changed about our chase strategy! Total for the day: 503 miles. 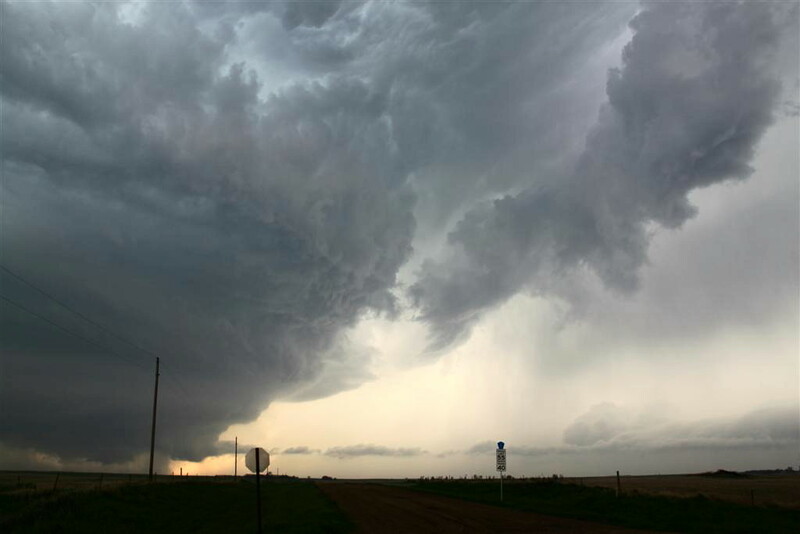 Click here to see the video of the Bowdle wedge tornado, the Roscoe elephant trunk and the fantastic storm structure of this supercell. The triple point just to our west. Note the two lines of cumulus clouds from two different air masses colliding. The clouds on the left are shearing off to the southeast, while the clouds to the right are shearing off to the north. We waited as one updraft after another shot upward near the triple point, only to eventually lose out to the capping inversion. But, each updraft also weakened the cap. 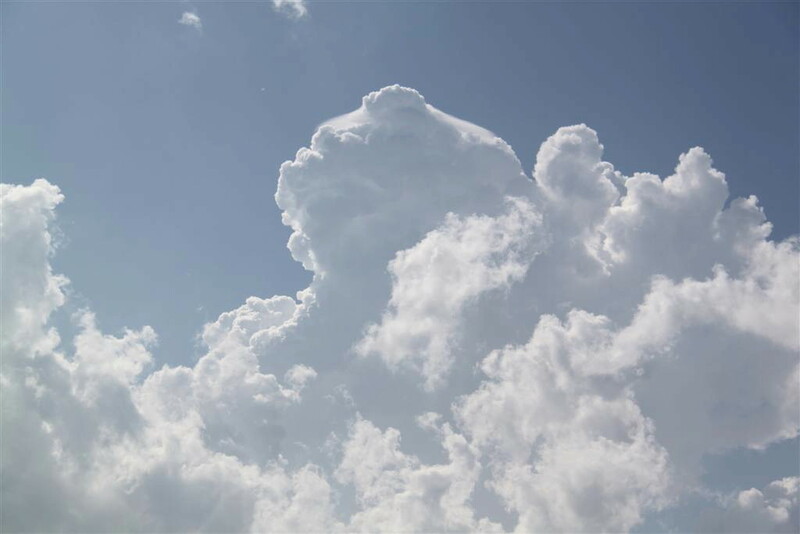 Here, a strong updraft generated a pileus cap (the milky top forming on the updraft). After watching the storm develop along Rt. 83, we headed east on a dirt road towards Lowry, SD. 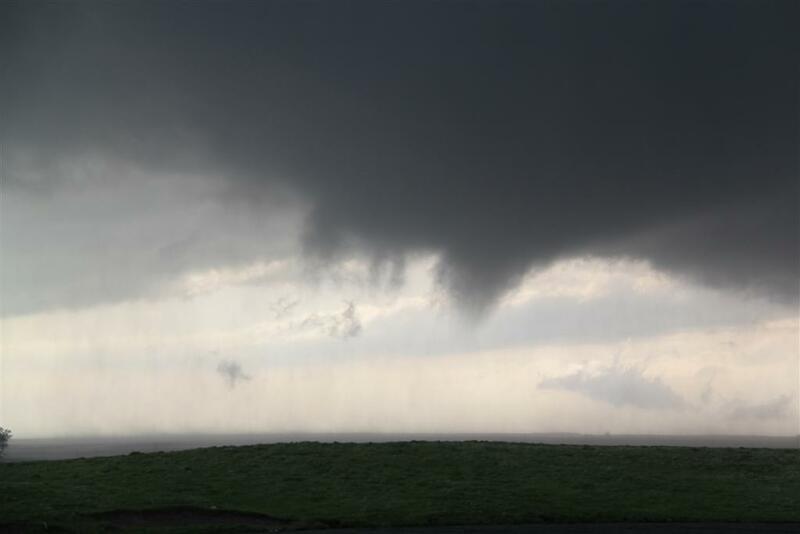 Here the storm spins up it's first funnel (foreground). Large inflow band steaming in from the northeast in the distance. After the first funnel dissipated, we head north, still on dirt roads, to keep up with the storm. 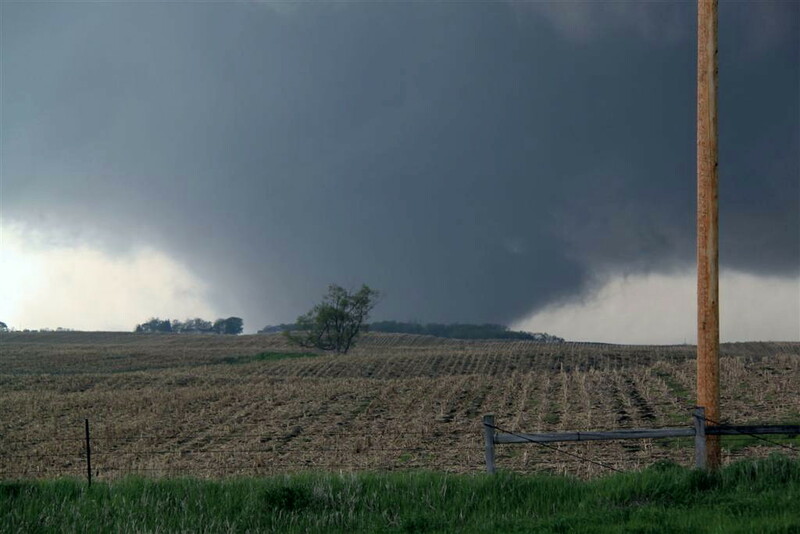 It was obvious that it would be producing tornadoes before much longer. Back on paved roads, we caught up to the mesocyclone, now coming right at us as we stop on Rt. 47. Tornado imminent! 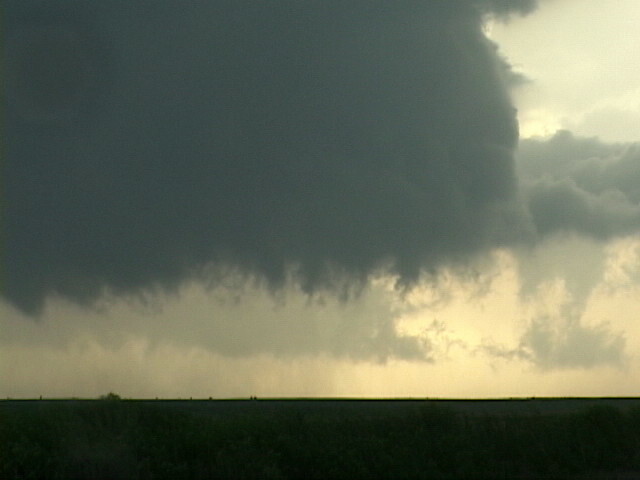 Closer look under the meso as the funnel closes in on our position. 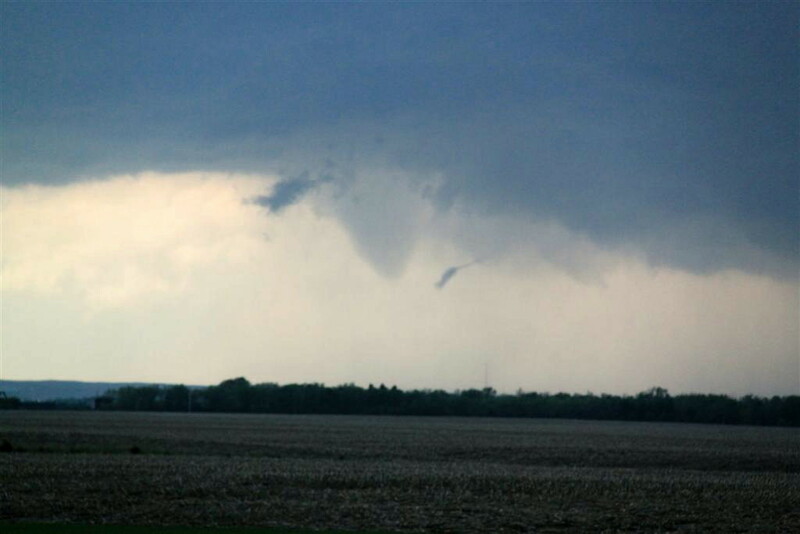 Cone funnel begins to reach toward the ground as rain curtains wrap around the rotation. About this time we have to beat feet north to get out of the way! Tornado! Just to our southwest as we blast north to get safely in front of it. Funnel fully condensed to the ground. Video capture of the beast just to our west as we continue to blast north. Farther up the road, we put a little distance between us and the tornado. As the tornado gets closer, it appears to be starting to lift off the ground. 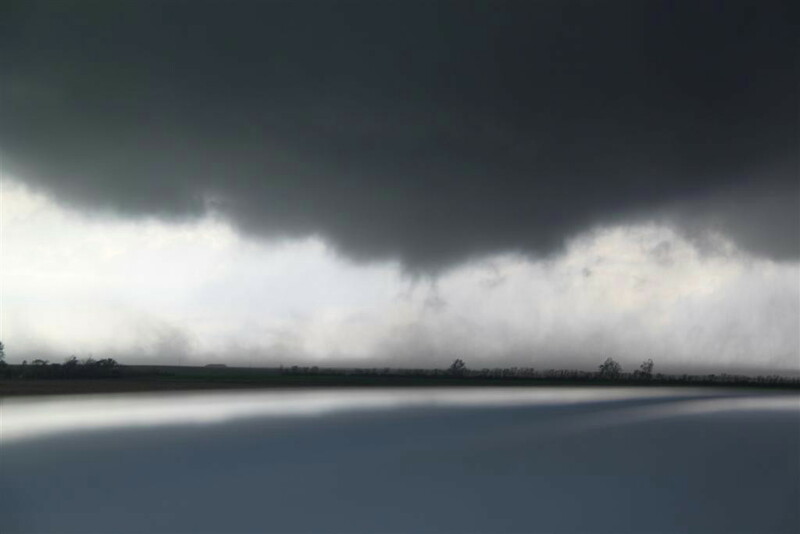 We stopped as the tornado approached the road and began to dissipate. At this point it is still throwing up a good deal of debris. 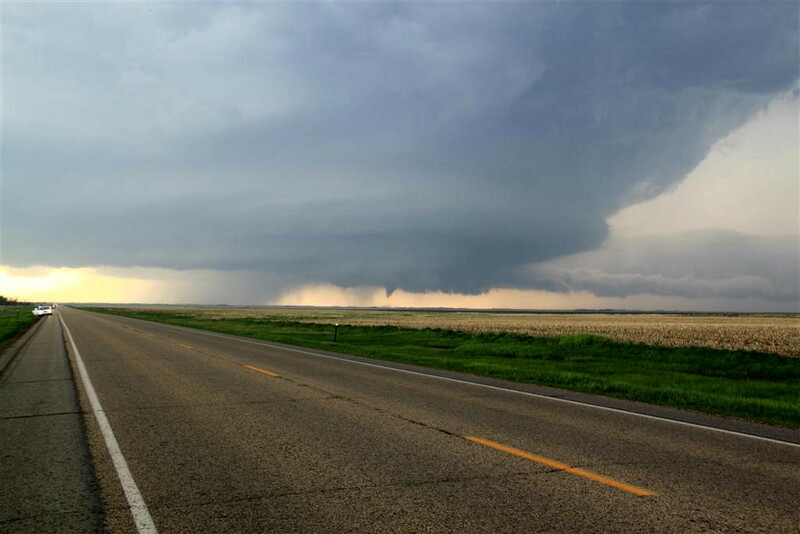 The tornado dissipated just before reaching the road. After the initial tornado dissipated we stopped for a moment on our east bound road. There is still a lot of debris flying around at the base of the rotation but there is no clear tornado on the ground. 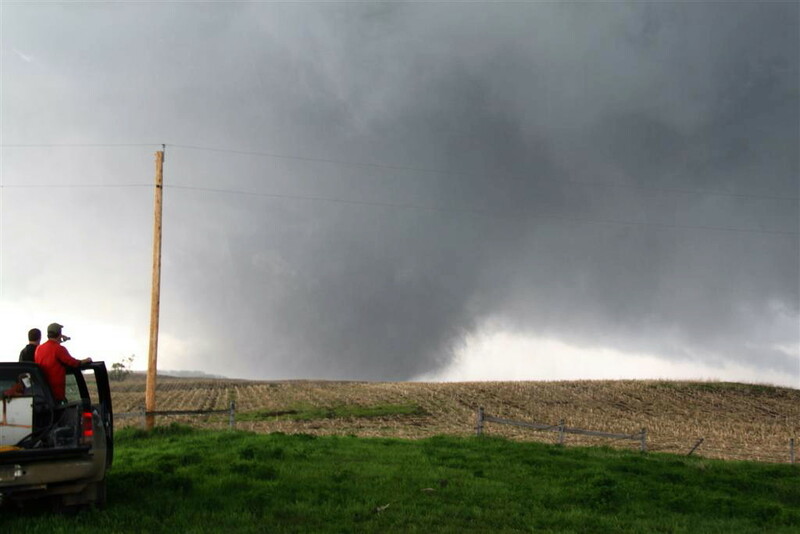 As the rotation crossed our former north-south road, the tornado began to reform. Too close for comfort, we ran for it to the east. 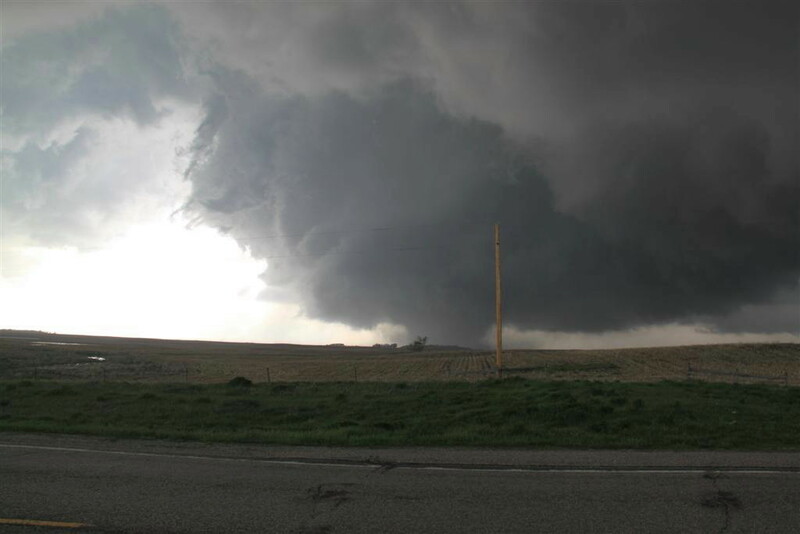 As we headed east towards Bowdle, SD, a violent tornado forms just to our south, throwing debris hundreds of feet as it heads towards us. This was about as nasty looking a tornado as I've ever seen! The "drill press" tornado closes in from the southwest as we charge east. 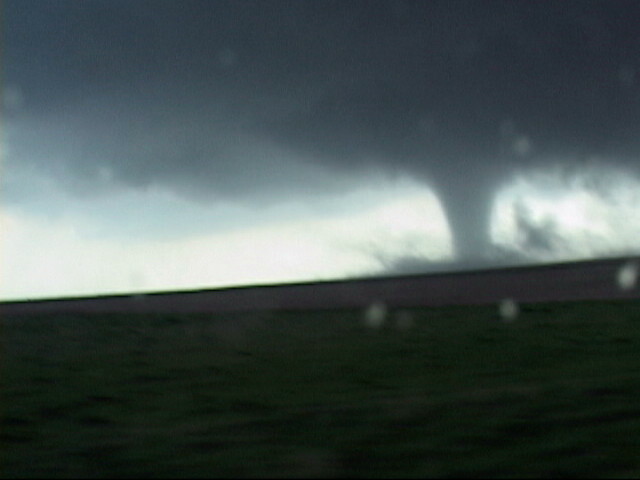 Getting closer... After heading east into Bowdle, we proceeded north of town while to our west, the tornado was "wedging out". 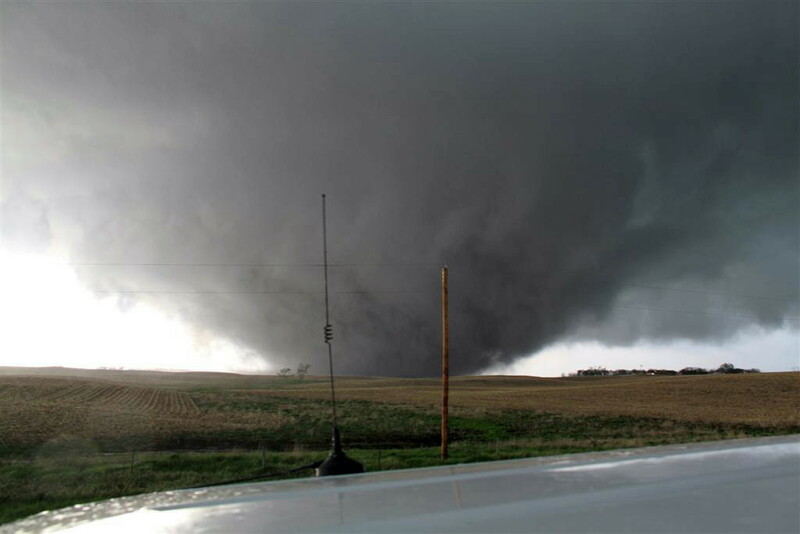 Now north of the town, the tornado morphs into a massive 1/4-1/2 mile wide wedge! 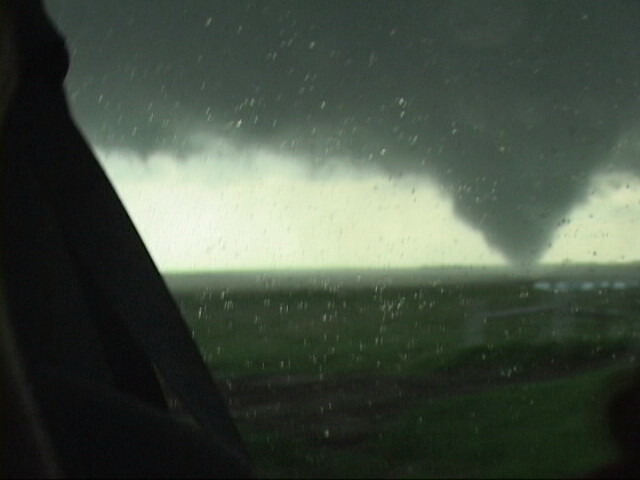 We were in perfect position to watch as the tornado approached from the west-southwest. 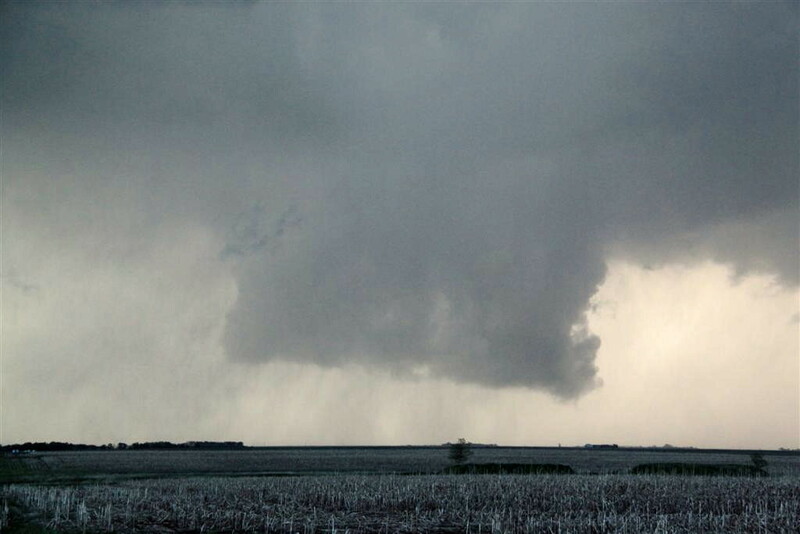 A zoomed out look at the greater storm structure above the massive tornado. Watch as I spin this tornado on my finger!!! 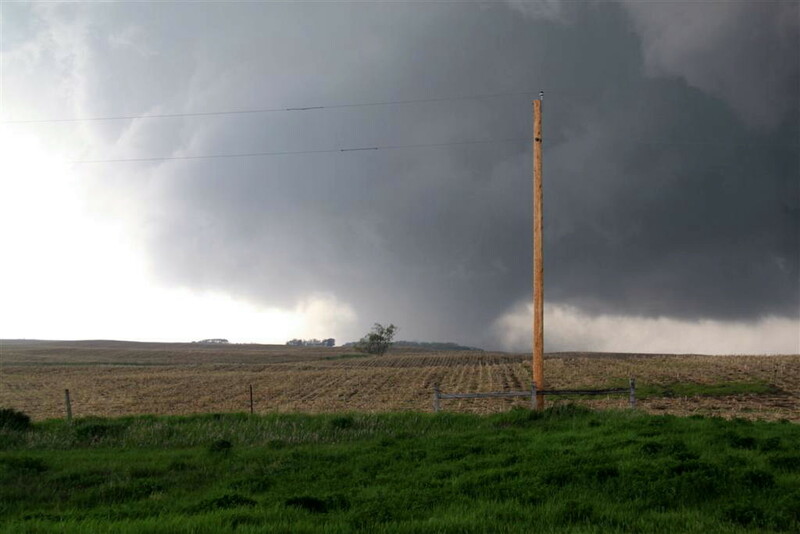 As the tornado closes in, farmers from a farmstead just off to the right of this pictures abandon their homes and get to safety, pulling in just across the road from us. The tornado is now no more than 1/2 a mile from us and coming fast. We decide that we need to move a little to the south to be sure we are out of the debris field. Yep, that's close enough! 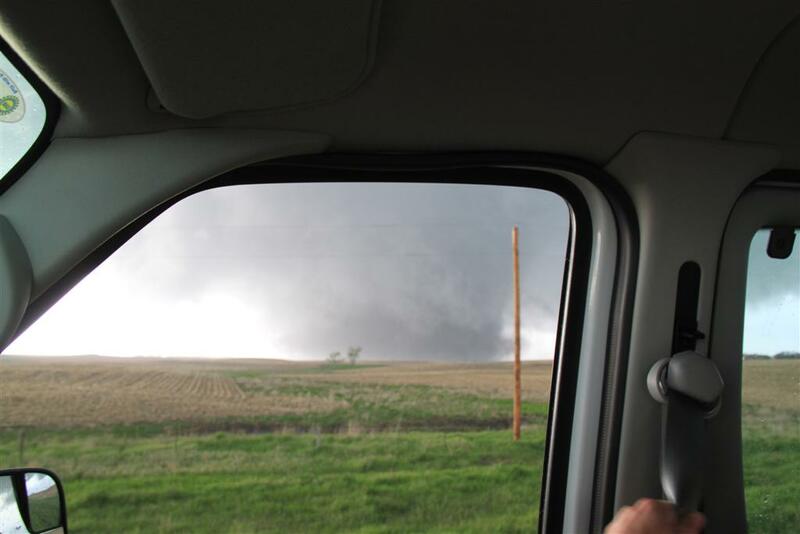 Now positioned about 1/2 a mile south of our previous location, the tornado closes in on the farmstead (just visible through the rear window of the van). With only another minute or two before we have to run to avoid getting clobbered by the rear-flank downdraft winds, I took this shot over the roof of my van. What an absolute MONSTER!!! 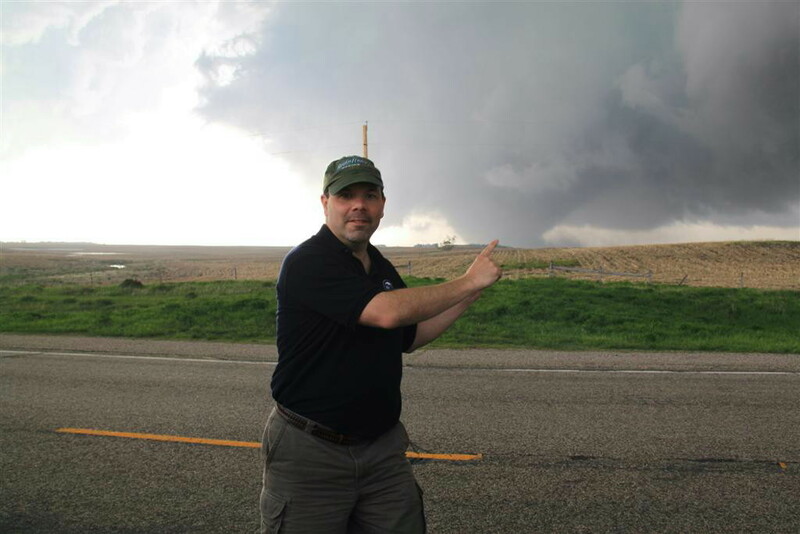 Best tornado I've seen in my 10 years of storm chasing. 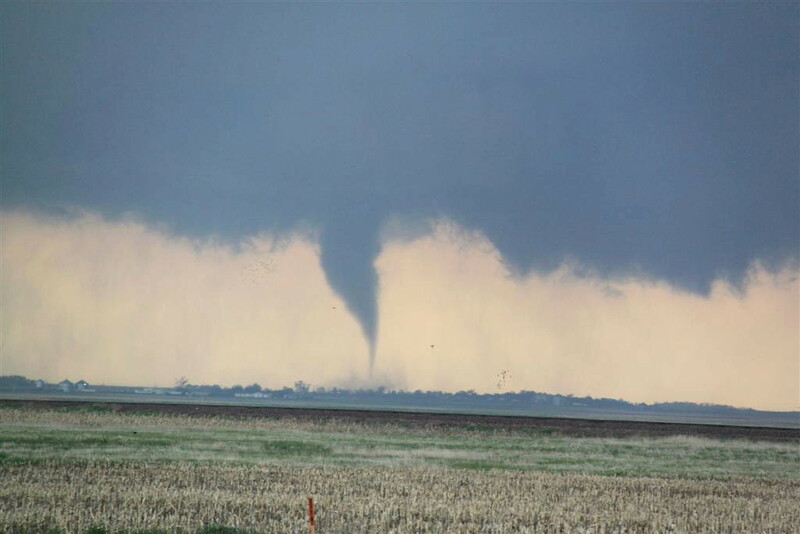 Unfortunately the farmstead, just to the right of the tornado in this picture, was very heavily damaged. After heading east through Bowdle and Roscoe, we stopped just west of Ipswich. 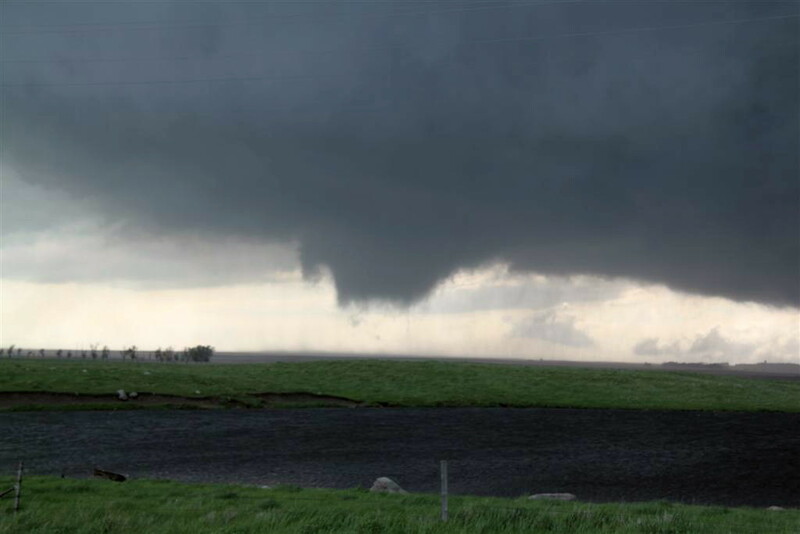 Looking back as a second meso-cyclone cycled up, a nice elephant trunk tornado with a significant debris fan formed just northwest of Roscoe. 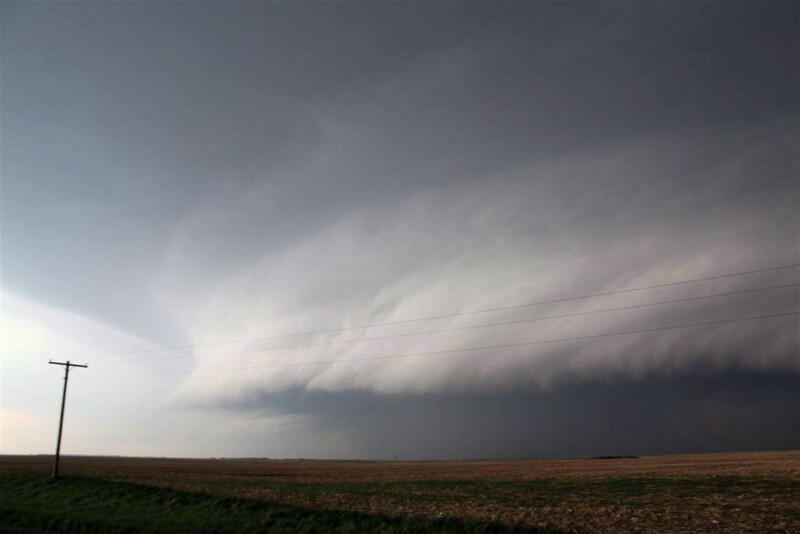 The larger structure of the storm during the second tornado. What a tank! The tornado takes on a "Wizard of Oz" look. 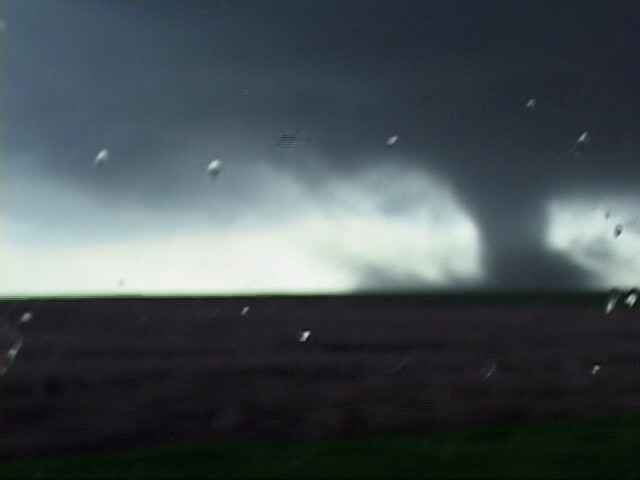 Later as the new meso moved to our north, it was spinning like crazy and seemed sure to produce another big tornado. 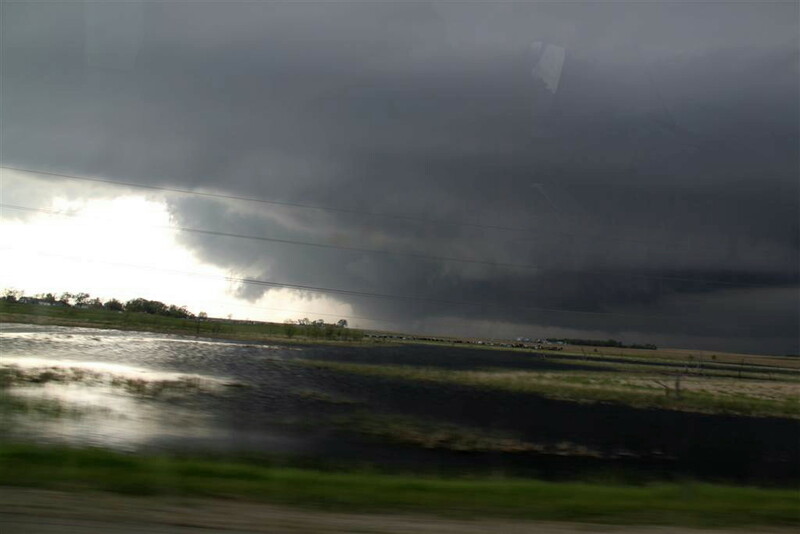 It didn't produce here but we went on to see three more brief tornadoes, including two at once, from this storm. A broader view of this incredibly structured storm. 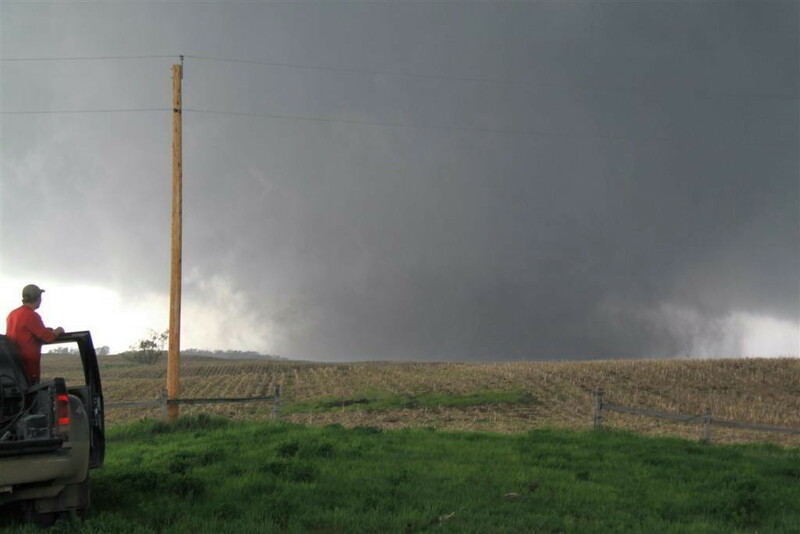 The area of rotation is just to the left of the telephone pole. Note the very long, skinny beaver tail still streaming in from the east. 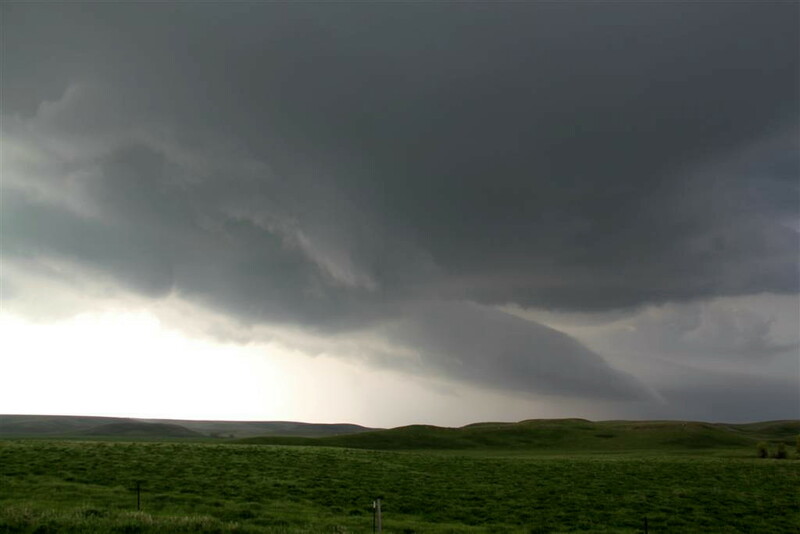 The storm featured inflow bands flowing in from both the east (foreground) and northeast (background). 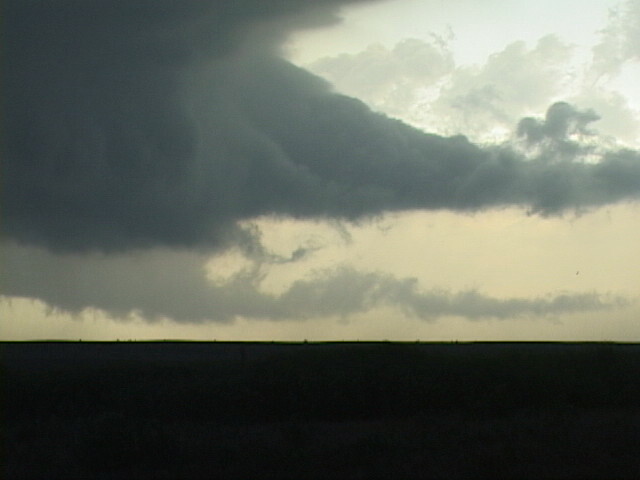 A better look at the long inflow band as the Sunset highlights the incredible vault area of the storm. Still south of Ipswich, we were simultaneously watching our storm move by to the northwest and waiting for another storm, also tornado warned, to come up from the southwest. Here is the oncoming "shark toothed" shelf cloud of our original storm, showing clear signs of rotation (left to right on the screen) A good look at the southern storm. 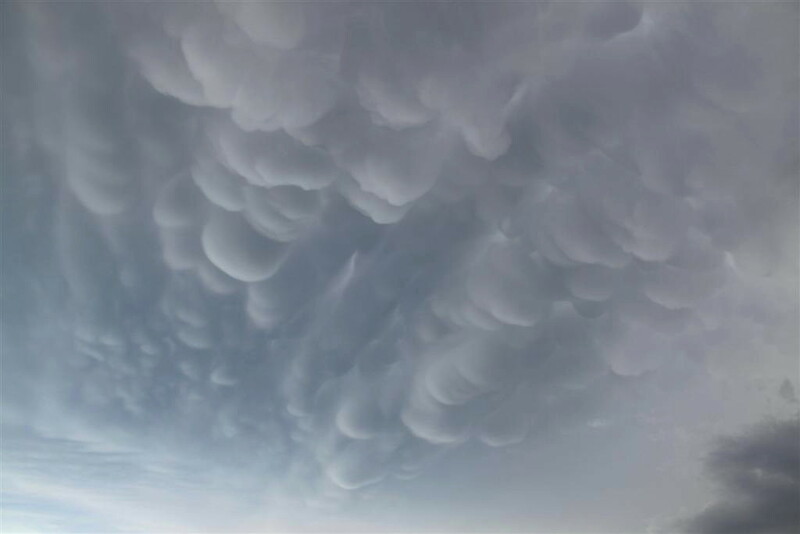 Mammatus on the anvil above left, striated updraft towards the right with precipitation core, and a mesocyclone to the left rear of the updraft (note the lowering). Also, a flanking line streams off to the southeast. Above us, cool looking mammatus clouds hang from the anvil. 3 "stacked plates" as the storm nears. 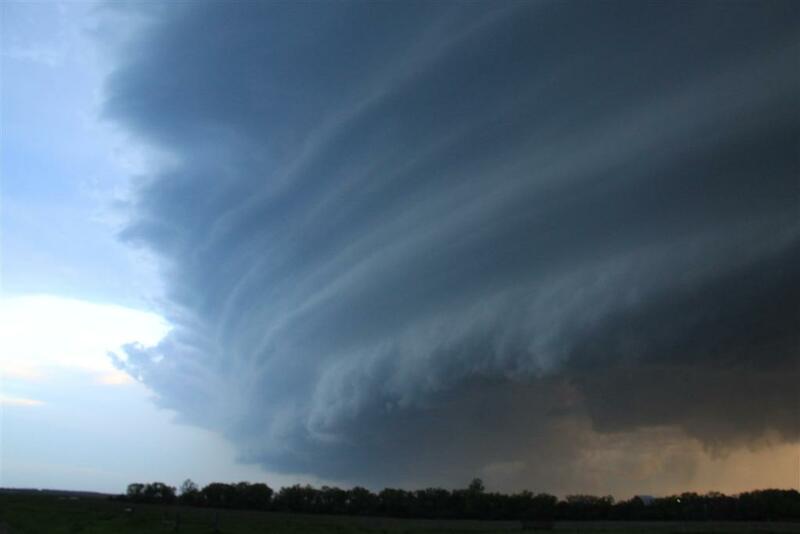 As the mesocyclone of the southern storm approached, it tried to tornado several times. Here a big cone funnel makes it about 1/2 way to the ground. WOW!! 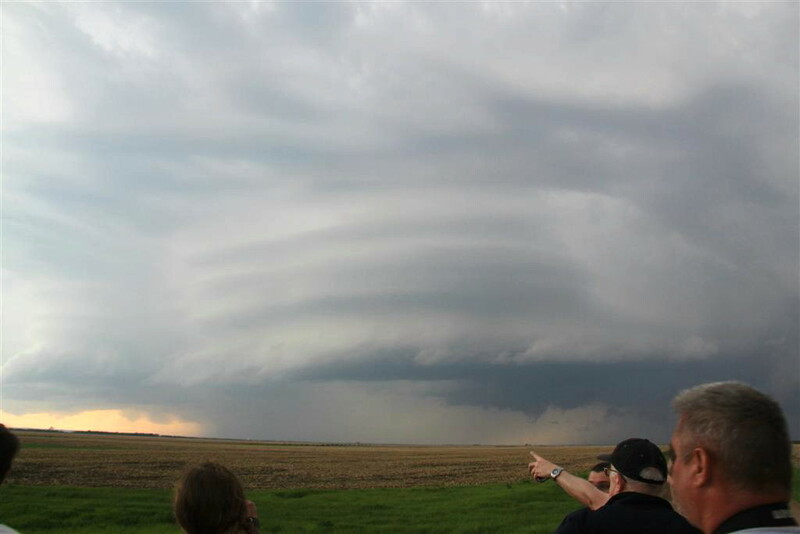 What incredible structure!! You won't see anything like this in New England!! Large block wall cloud from the 2nd storm passes just to our west. The second storm was showing signs of going high-precipitation by now, a sign that the tornado threat is diminishing. With that and also the fact that it was nearly dark. 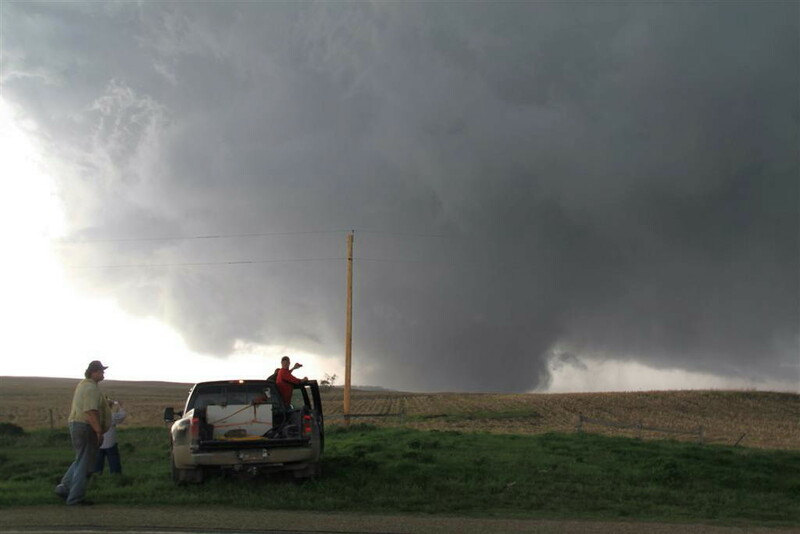 It was time to call it a very successful chase day and head for the hotel for the night in Winner, SD.